Hello from the farm! Spring seems to have come early this year, at least the spring temps seem to be ahead of schedule. It’s been a great year for fruit bloom, with lots of sunny days, and active bees. We are hoping to see a bumper crop of peaches and cherries as well as more apples that we got last year. Things are rolling in the garden as well. Planning and planting for 150 shares is vastly different from planting for 10 shares. Kind of hard to convince myself that I need 200′ bed feet of sugar snap peas, when 12′ was enough last year. We are finally winning when it comes to bed prep as well. The wonderful rain we have had has made it slower to get into the areas the pigs went through last fall. In part, this is because the weather has been warmer, and grasses have started growing sooner/faster than usual (or at least faster than I expected). This has necessitated more soil prep than we had planned, but as I said. We are winning! We are still probably about 4 weeks away from our first share delivery, and we still have room! (Click here for the sign up form) We are asking folks go get their deposit in to hold their spot ($200), and to try to get paid in full as soon as they are able. On the CSA / Farm Share side, we have partnered with some great folks for pick up locations!!! We will have Tuesday pick up available in downtown Marysville! The location is close to the freeway, and we are excited to be able to bring our food to a widening community of friends!!! We also are super excited to have a location in Seattle!!! Just North of Greenlake, and south of Northgate Mall. We are still working out the day of the week that we will be delivering those shares (early sign ups’ can weigh in on that decision). Our web based sign up sheet has been updated to show the two remote pick up locations (no extra fee), and if you have any other comments or questions, please feel free to use the comment field at the end of the sign up for that. You can also print it off and mail it in, or just give us a call, and we can walk through it for you!!! Our Spring Farm Open House is also in the final planning stages. More info to come on that, and we’ll have that on Facebook and in an email invite, so keep your eyes peeled!!! Both our dairy does have kidded now, and we are once again enjoying all the fresh milk, cheese and yogurt we can eat! We only had boys this year, but they are still cute, and fun. They will be on hand at the open house, and will be weaned shortly and able to go home with new owners. Once again, Farm Open House is coming in another couple of weeks, and if you have questions about our CSA Farm Share, Here’s the post that talks all about it. Ready to sign up? Just fill out our order form HERE, and we will invoice you for the deposit! 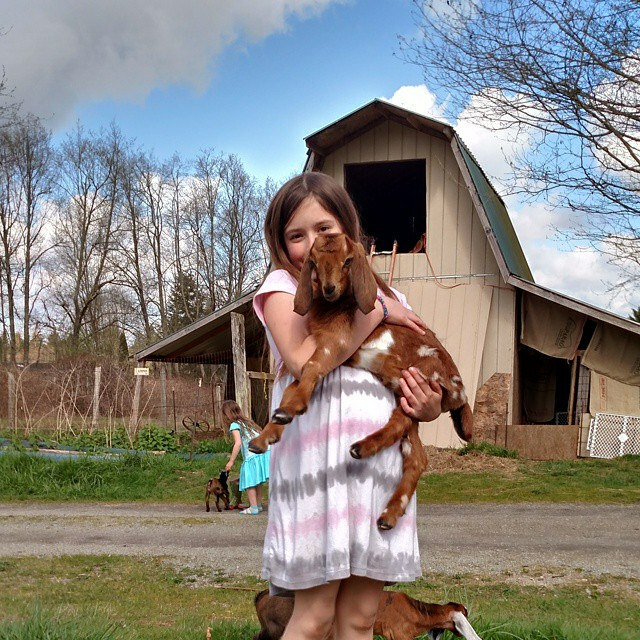 This entry was posted in Critters, CSA, Farmer Adam and tagged Arlington CSA, Camano Island CSA, family farm, local produce, Marysville CSA, Seasonal Produce, Seattle CSA, Stanwood CSA on April 22, 2016 by adalynfarm. After a dark cold winter it’s nice to be enjoying some of the left over greens from the garden. It’s also exciting to see all the little specks and flecks in the seed packets come to life, lift their hands to the light and GROW! Basil, Nasturtium, Calendula and Pac Choi! That’s not the only thing growing on the farm! Last Friday Marbles, the spotted doe threw (that’s farm talk for gave birth) to two strapping bucklings (boys). They are getting bottles 4 times a day, and are getting more coordinated every day. HERE IS THE SIGN-UP LINK! This entry was posted in CSA, Farmer Adam, Veggies and tagged Arlington CSA, Camano Island, Camano Island CSA, Local Farm, Local food, Marysville CSA, Organic, Slow Food, Stanwood, Stanwood CSA on March 23, 2016 by adalynfarm. What is a CSA, and who is Adalyn Farm? First, we are Adalyn Farm. Adam and Joscelyn Stevens (along with our daughters and extended family). We are a small farm (5 acres) in Stanwood Washington. The calling on our hearts is to care for our planet, locally and through community. There is more about that, and our story here. And here are a couple videos from last year on the farm…. So there you go, that’s us. So what is a CSA? Well, here’s another video! It’s way better than me trying to explain it. And that’s what we are doing this year! Here’s a link to the Flickr gallery of all 25 weeks last year. Last year was a pilot year with Adam still working full time off farm, and we expect the shares to be even more bountiful this year as we plan on transitioning to full time farming! We are offering on farm pick up and delivery. You can get Hayton Farms fruit with your share this year, and Deanna is doing flowers if you want local beauty on your table all summer long! This entry was posted in CSA, Farmer Adam and tagged Arlington CSA, Camano CSA, CSA, local produce, Organic, small scale farming, Stanwood, Stanwood CSA on February 26, 2016 by adalynfarm. Flower CSA! From Twig and Vine in Stanwood Washington. We can’t do it all. But we also think that shouldn’t mean you shouldn’t have choices, options and some beauty in your life, and we have an opportunity for our CSA customers, to have a fresh local flower arrangement weekly with their CSA vegetables. While we are growing your veggies, Deanna from Twig and Vine will be putting together some of the best of the seasons flowers to grace your table! Deanna has been arranging flowers for local brides, offices and other customers for years. We are excited to have the chance to partner with her to offer a 10 week season of fresh local flowers, grown with the same care as we are growing your food (That means no bee harming sprays or chemicals, and with a mind to the stewardship of the soil). The cost for the 10 week season is $250, which is a good deal, and unlike the $30 arrangements in grocery stores, all of your investment will stay in the community. These flowers aren’t brought in from out of state, these are local. Like 25 miles local. Additionally, if you add on delivery for your CSA, your bouquet will show up with your weekly box of local produce at no extra charge! Deanna expects the season to start in July. If you have any questions, you can e-mail her at twigandvine(at)gmail.com, or get in touch with us!! CSA Sign up link here!!! This entry was posted in CSA, Farmer Adam and tagged Arlington CSA, Camano Island CSA, CSA, family farm, Flower Farmer, Local, Local Flowers, Local food, Organic, Seasonal, Stanwood, Stanwood CSA on February 17, 2016 by adalynfarm. It seems like no matter the season, it’s our favorite, and it’s the busy one! This summer has been fun, and busy, and crazy! To re-cap our pilot year CSA has gone REALLY WELL! We’ve had great feedback, we have learned more than having taken a 10 credit collage course, and worked a full time job to boot! We are super excited about the 2016 season, and although it’s early for CSA sign up’s we are already taking deposits. We’ve added some cool stuff too. We have an add on option for berries, and weekly bouquets. Also, cause we are busy and feel the ‘too much to do’ pressure, we are offering DELIVERY! Initially we will deliver to Stanwood, Camano and Arlington, but if you are interested, and outside that area, please get in touch… There are images of all 25 weeks on our flickr page, if you want to see what the Half Share size we did this year looks like. 9 of the shares from this summer. Turkeys are done! Most went into the freezers of our customers who got their deposits in back in May. We did have a couple folks who didn’t wait and cooked them up fresh. Word is they are great! Which is always nice to hear, especially since Farmer Joscelyn and Farmer Adam (with some help from Grammy) were the butchering party this year. The night before ice camp. The December pigs are doing well too! We still have half a pig available. Deposit is $125 for the half. They are busy right now digging up for the garden for next year, eating our old pumpkins and getting LOADS of other organic produce trimmings. The rototillers just before their move to the new patch. Fall colors by the back woods. Whew! Told you it’s been busy! If you want more info on the CSA for next year, Here’s an info link, and the link is below for sign up! Are you ready? HERE IS THE SIGN-UP LINK! This entry was posted in CSA, Farmer Adam and tagged Arlington CSA, Camano Island CSA, CSA delivery, family farm, Local food, Organic Food, Stanwood CSA on November 24, 2015 by adalynfarm. Adalyn Farm 2016 CSA sign-up’s are HERE!!! This is what we have been working towards for almost 5 years! First, let us tell you what a CSA is. CSA stands for Community Supported Agriculture. First coined in the 80’s, it was a farming business model that allowed local customers to have easier access to local, seasonal food, while taking a little bit of the risk from the farmer and sharing it with the customers (traditionally surplus is also shared with the customer). The local food scene and eating in general has changed a lot since the 80’s and so have some CSA’s. We are striving to get back to the roots of a CSA, while leveraging modern technology to give today’s customers what they want. All of the vegetables and meat you get will be from our farm, we DO NOT buy in any vegetables or meat from other farms. We feel local food security is important, and local means local. Even the flower and berry add-ons we offer are grown within 20 miles of our farm, not trucked in from California’s central valley or Mexico. This does mean some things will not be available all season long. You will have choices, not every week, but as much as we can. Through our weekly CSA email update, when the harvest allows us the flexibility, you can select different options depending on your share size and what is in abundance or scarce. If we have an abundance, you might get to choose between more lettuce or more carrots, or between a new veggie or some of the more traditional garden fare. You will have the choice to do on-farm pick-up of your share, or have it delivered to your home for an additional cost. We highly recommend on-farm pick-up for several reasons: the chance to pick up surplus veggies beyond what is in the shares (depending on availability), to pick up eggs that are available on a first-come, first-served basis, to see what’s happening on the farm, to visit some friendly animals, and so you can get to know your farmers and where your food comes from. We are also partnering with two other local farms to provide berries and flowers as add-on options with your vegetables!!! We are excited about partnering with Twig and Vine as they explore offering a flower CSA. Deanna has been arranging for weddings and custom orders and is excited to have folks all over the area enjoying her flowers! Her 10 week season will start in July (when the blooms are ready), and will run for 10 weeks. Your arrangement will be in your box at pick-up, or delivered if you select CSA delivery as an add-on. We know how much our family enjoys seasonal fruit, so we are very excited to offer an add-on for a berry share. Hayton Farms is a fifth generation farm growing organic berries in the Skagit Valley. Your berry share will include different varieties of blueberries, blackberries, raspberries and strawberries as they come into season. Each share will include 1/3 flat, that’s four pint baskets of local, organic fruit!!! The season starts in mid-June and will run for 17 weeks. They will be in your box at pick-up, or delivered to your door if you select for CSA delivery. Here is the breakdown of what we are offering. To hold your place you only need to pay the $200 deposit (which applies toward your total). We will invoice you monthly for the balance (full payment due by April 31st). Farm CSA with choices! 25 weeks of a variety of fresh, organically-grown veggies and greens. Delivery to Stanwood, Camano Is. and Arlington! $135 for the entire season. Farm Bouquets! Arrangements from the talented, local floral artist at Twig and Vine. Included in your box starting in July and running for 10 weeks. $200 for a 10 week season. Berries! 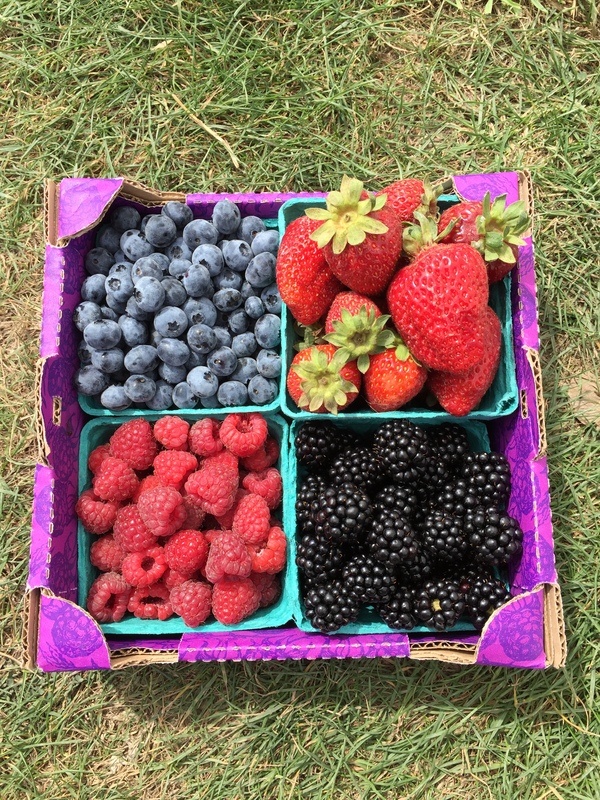 A variety of local, organic berries from Hayton Farms. 1/3 flat (that’s 4 pint baskets) included in your box starting mid-June and running for 17 weeks. Adalyn Farm Organic, Pasture-raised Chickens! You determine if you would like to give a monetary gift toward helping us provide fresh, healthy food to a family that is struggling to feed themselves. Additionally, if you refer a friend to us, we will discount your CSA share by $20 for each family who signs up for either of our two share sizes. This credit can only be applied to the main CSA share and cannot be applied to the Add-Ons. To receive credit, your friends need to put your name in the field at the end of the sign-up form where we ask if anyone has referred them to us. Just think, you could have a free share this summer! This entry was posted in CSA, Farmer Adam, Farmer Joscelyn and tagged Arlington, Arlington CSA, Bellevue CSA, Camano CSA, Camano Island, family farm, Kirkland CSA, local produce, Organic, Pastured Poultry, Redmond CSA, Small Farming, Stanwood, Stanwood CSA on September 16, 2015 by adalynfarm. It’s never easy to say goodby to our little ones, but we are sure they will find some good homes! 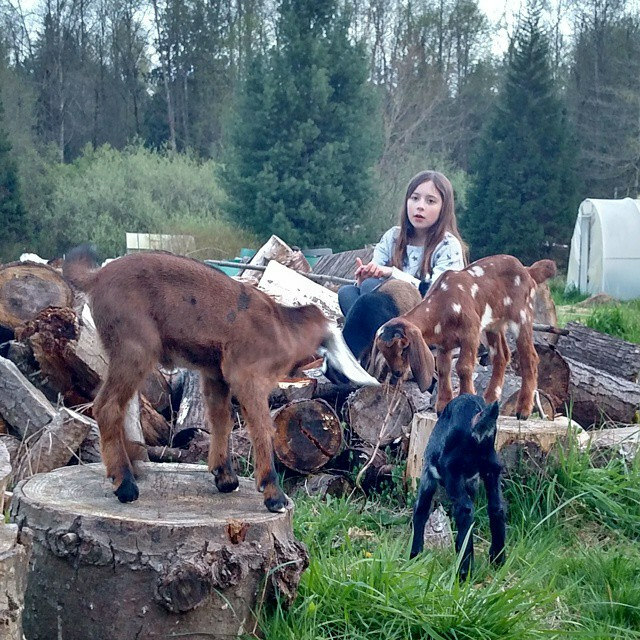 Beautiful and super-friendly pure-bred Nubian and Nigerian Dwarf 4 month old baby goats for sale! All bottle-fed, raised playing with children, tested CAE/CL/Johnnes Negative, variety of colors, ranging in price from $75-$250. Come meet our sweet babies! 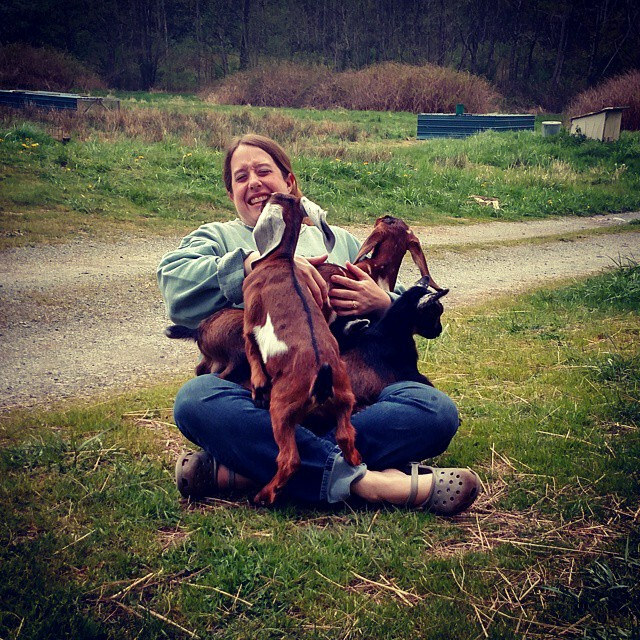 Because goats are herd animals, we will only sell singles to families that already have goats at home, or we will sell in groups of two or more to those that do not have goats at home already. 4H discount available! Please get in touch via e-mail or phone to arrange a visit or get questions answered! This entry was posted in Critters, Dairy, Farmer Adam on August 12, 2015 by adalynfarm.